UTK is located in downtown Knoxville, Tennessee, just off the I-40. The local airport is McGhee Tyson (TYS), about 20-25 minutes by car from the university and downtown Knoxville. Metered taxi fare between the airport and hotel runs about $30.00. A block of hotel rooms at a special conference rate of $88-$93/per night has been reserved from Thursday, September 24 – Sunday, September 27. The hotel is the Four Points/Cumberland House. Please book through the weblink, or state on the phone that you are attending the DDHR conference, to get the special rate (available until August 26, 2015). We cannot guarantee the special conference rate for latecomers, so please reserve your room early! 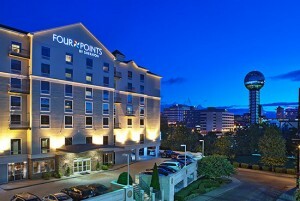 The hotel is an easy 15 minute walk to the UT College of Law (conference venue) and to many restaurants, bars, and shops in the downtown and UT campus areas. If you are driving to the conference, attendees should park in Volunteer Hall parking garage on White Avenue. The cost of parking is $5 per day.